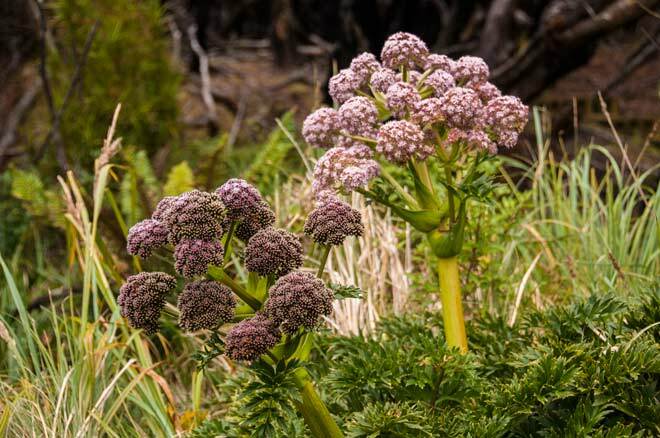 The subantarctic islands are known botanically for their unique megaherbs – large-leaved, flowering alpine plants. This Anisotome latifolia is on Adams Island, the southernmost of the Auckland Islands. The island has been a reserve since 1910, and because its megaherbs are protected from browsing animals, they are particularly profuse. Anisotome latifolia is a member of the carrot family and flowers in early summer.